Johannesburg couturier Howard Green is best known for the exquisite detail he puts in his gowns, from hand-stitched beadwork to ensuring the perfect fit. “We make gowns that fit the body like a mould,” he says. Green has a reputation for being a perfectionist and a stickler for craftsmanship; one who lavishes time and care on a design until he’s happy with it. More than anything, he serves a particular idea of beauty: “Anybody in this business must have a deep love of really beautiful things.” It’s an ethos that spills over into his home: a beautifully appointed apartment in Killarney’s famed Whitehall Court. Built in 1924 by the renowned British-born architect John Abraham Moffat for maverick New York entrepreneur Isidore William Schlesinger, who made a vast fortune in South Africa from insurance, film, property, and hotels (including the majestic Polana Hotel in Maputo), Whitehall Court is arguably the finest example of neoclassical colonial architecture in the Gauteng district of Johannesburg. The American mogul’s massive apartment filled half of the building’s second floor, while the rest of the structure housed offices for his various ventures. At the end of the Second World War, however, the three-storey building was revamped into a series of private residences. “I didn’t even know this building existed until I was driving past oneday [25 years ago] and I thought I was having a heart attack,” Green admits. His apartment is a subdivided part of Schlesinger’s original, which had a sense of scale and grandeur unmatched in the building, and details like the intricate plasterwork finishes are rare. “You don’t find features like this often,” he adds. The apartment’s interiors more than live up to the grandeur promised by the building’s pristine white exterior. Here, for over a quarter of a century, Green has built up a remarkable collection of furniture and art, painstakingly selecting each and every piece. “I’d rather live in a bare room than have something that I don’t like, quite honestly,” he says. Indeed, nothing is strictly utilitarian for this designer. But the image that immediately strikes you as you walk through the door is deceptive. The strikingly powerful spot painting by artistic enfant terrible Damien Hirst hints at unconventional sensibilities lurking beneath a classic façade. 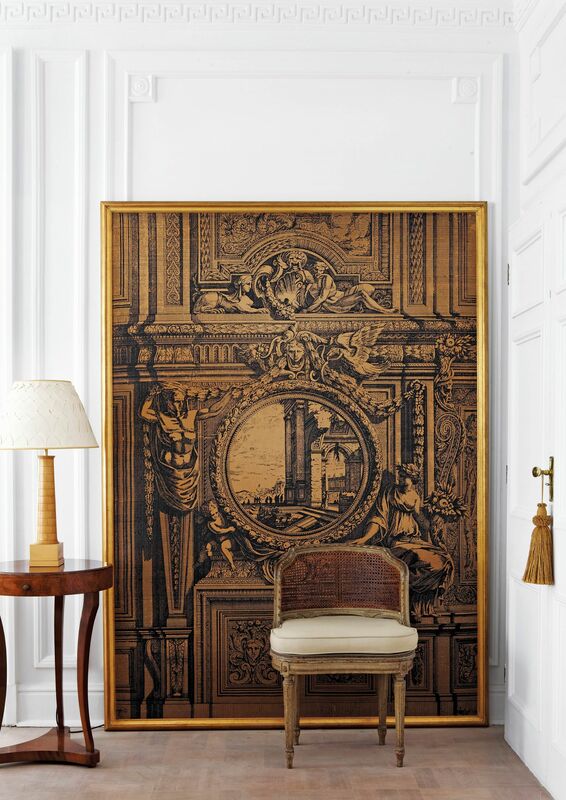 The furnishings in any given room are likely to veer from gilt antique French pieces through mid-century modern classics and then take in contemporary designer pieces, too. “If you have a look around here, you can see that nothing matches,” Green says. In the sitting room, for example, modernist classics such as Jean Prouvé’s Guéridon table and Eero Saarinen’s Tulip table and armchair for Vitra rub shoulders with a number of French antiques. The work of contemporary designers is also well represented, as seen in the presence of Moooi’s Oblique bookshelf by Marcel Wanders, the Bouroullec Brothers’ Facet sofa for Ligne Roset, Patricia Urquiola’s Driade flow chair, an iconic three-legged stool made of birch by Alvar Aalto, and Philippe Starck’s Pratfall chair. There are even examples of modern South African design, as seen in the Albert coffee table crafted by local firm Tonic Design. Perhaps the item that best captures the spirit of Green’s home, however, is the pair of Light Shade shades by Jurgen Bey for Moooi. There’s one in the entrance hall and one in the living room. Their cylindrical mirrored surface hides a surprise. “When you look at it from the outside without the light on, it looks very modern and simple,” he explains. When switched on, the mirror turns translucent and reveals an old-fashioned chandelier inside: a ghostly classicism inside the modern exterior. The flat itself might also be the opposite: offbeat and modern inside a classical envelope.